Will our graduates be seen again? Please, read on! 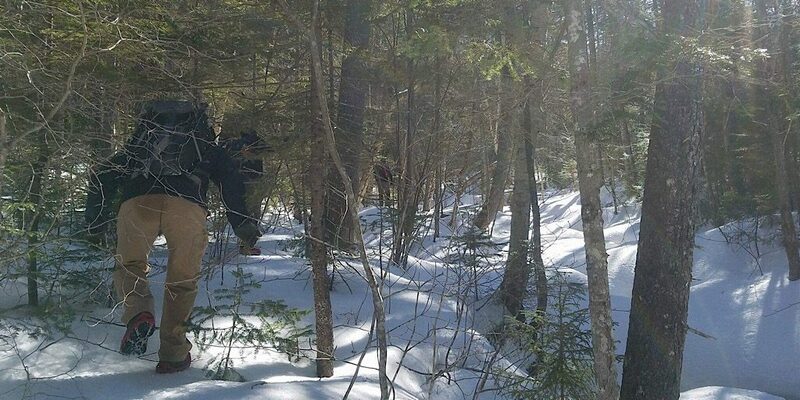 One of the things most people would want to avoid in the early spring while there is still snow in the woods is to bushwhack. 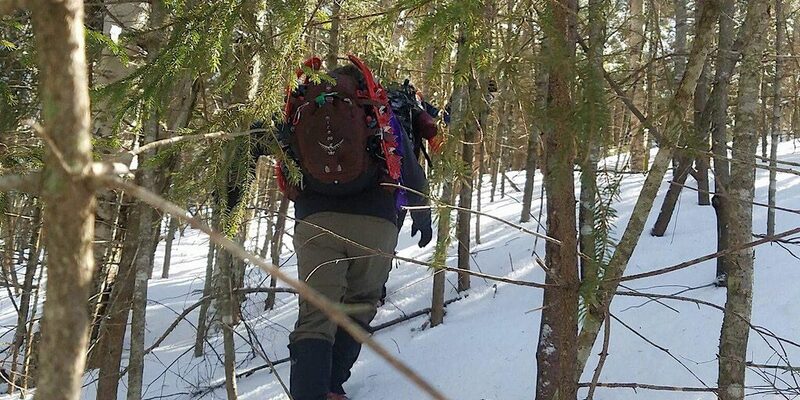 Unless, that is, one is participating in a two day Wilderness Navigation course. And unless, of course, one doesn’t say bring it, asking for an intensive bushwhacking experience. On duty for this one were Redline Guides Mike Cherim and Ken Hodges. Mike taught the first day while Ken shadowed, then Ken took lead for day two. He chose the second day’s objective, the 3393-foot West Huntington, and tasked the team with coming up with various strategies to get them there. Ken had a plan all laid out, but the team working on it overnight would hopefully reinforce day one’s material and the critical thinking involved. Mike had even created plot-ready team maps. It was homework (just some of that which was assigned). We encouraged them to also do some research online. We strongly recommend using all the tools available. These are select scenes from day one’s training. 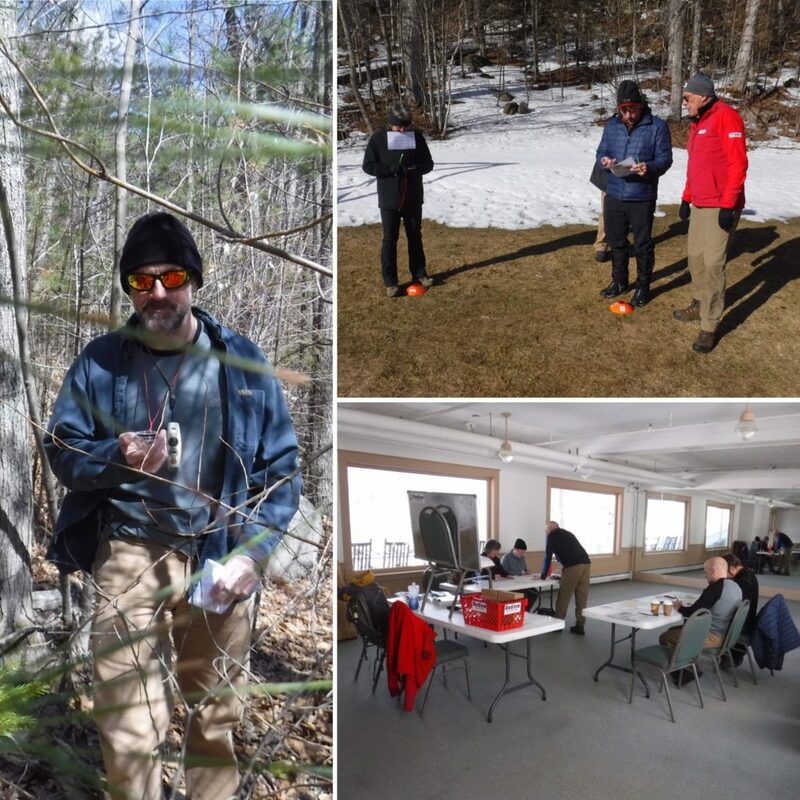 This training began at the Eagle Mountain House in beautiful Jackson, NH. For more training photos, please check out this album on Facebook. 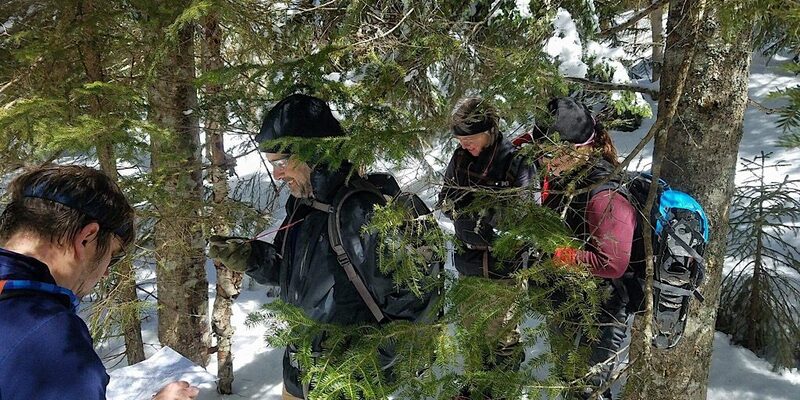 Doing research brought them to the SectionHiker blog and an article by Philip Werner featuring, yep, our very own Ken Hodges. Small world. Thanks to this they were all on the same page in terms of a plan. The plan, well that was to hike into Hancock Notch Trail a little ways before ascending a ridge to the West Huntington summit. 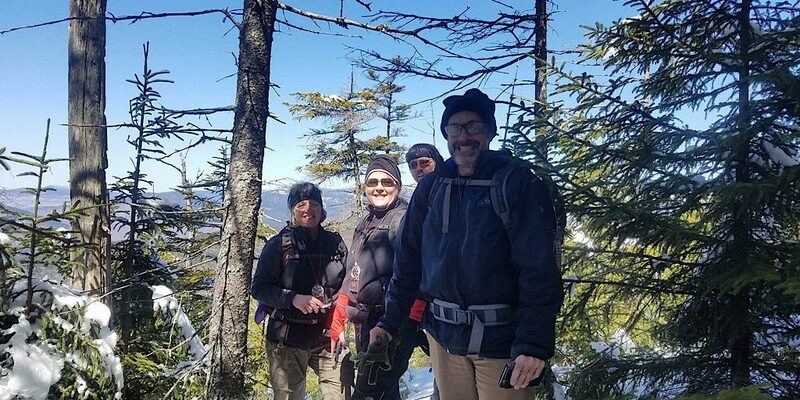 The had an additional plan — a plan A extension, so to speak — and that was to drop to the bottom of the col between the west peak and Mt Huntington, then dogleg toward the higher 3700′ mountain. As it turned out they decided upon reaching the col between the primary and secondary peaks to call it a day and go back out the way they came. The sun warmed the snow as they made their way out making the trees drip (an understatement as the drips were actually massive chunks of slush) and causing them to posthole. 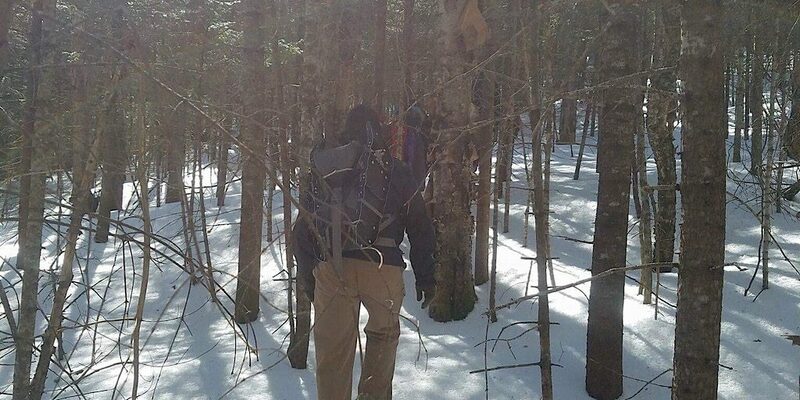 They wisely carried snowshoes but the woods were so dense, it was too difficult to use them so they didn’t. The morning ‘shwhack in didn’t require absolute precision, though the team was capable. They were being wise. The woods heading up aren’t too terrible. We’ve seen a lot worse. Ken supervises from the rear. The same old, same old. There is that on bushwhacks. One must enjoy the forest. Some of the rewards are standing in places few have stood. Albeit with limited views in this case. Wow, nice day! At the West Huntington summit. Congratulations team! In the col they really start putting those navigation skills to the test. Ken observes, impressed. Over all it was a solid two-day experience with a metric ton of learning as well as some good times — we did detect some smiles in those photos. 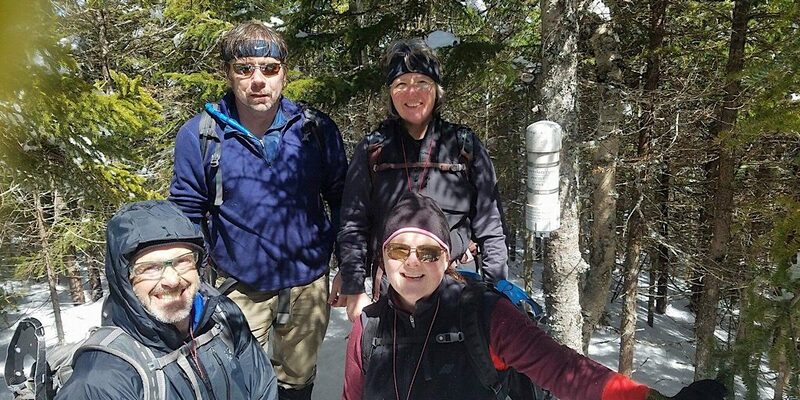 We started slow, ramped it up, then before long the team was deep in the mountains ascending a snowy, wooded peak with no trails with confidence. On this last front Ken commented that they absolutely had confidence out there taking the exercise seriously and thus doing it quite well indeed. 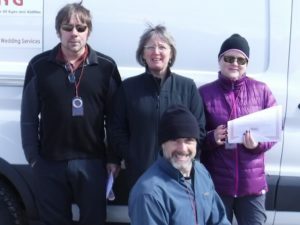 Congratulations to Rodney, Tim, Roz, and Sandra! Well done, team!